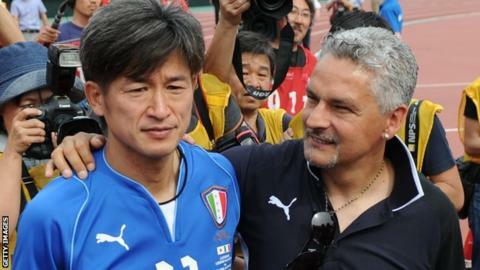 Japanese footballer Kazuyoshi Miura has signed a one-year contract extension with Yokohama FC at the age of 48. The man known as Kazu, or 'King Kazu' by some fans, will stay with the second division side past his 49th birthday. Kazuyoshi first played for Brazilian side Santos in 1986, so his deal will see his career span over 30 years. "I'm thankful to the club staff and supporters who always offer me support," said Miura, who scored 55 goals in 89 appearances for Japan. "I'll continue to give everything I have and strive," added the former Genoa and Dinamo Zagreb striker. Perhaps unsurprisingly, Miura holds the record as the oldest scorer in Japanese football - a winner in a second division match four months after his 48th birthday. He was particularly prolific in guiding Japan to the 1998 World Cup, scoring 14 goals in qualifying, and last played for the national side in 2000. His career, which started when he moved to Brazil to play youth football aged 15, is one of the longest in football history. Last week ex-England striker Teddy Sheringham registered himself as a player for Stevenage - where he is manager - at the age of 49 but opted out of playing in a local cup competition.